When Elaine Murphy was diagnosed with an aggressive form of breast cancer in October last year she feared her two teenage boys mightn’t be able to cope. But she needn’t have worried. Instead Joe, 17, who is Autistic and Jimmy, 16, who suffers from Dyslexia, have “shone” as they looked after their mum and then in turn their dad Gerry, who was struck down with Crohn’s disease in March. Elaine said: “They have had their own academic issues, but they have come into their own this year. They have got all merits and distinctions – they have never got that before. They look after all the household chores and don’t let me lift a finger. “They are so caring,” she praised. Mum-of-three Elaine, 49, said her boys have grown into young, mature men since her diagnosis and continue to make her proud by excelling at Coláiste Chraobh Abhann School as they study for their Leaving Certs; as well as taking new responsibilities in their stride. 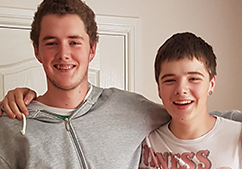 “Because I had no immune system, I couldn’t visit Gerry in hospital when he was being treated for Crohn’s but the boys were so organised they would come out of a visit and say ‘Dad needs this and that’ and get it all sorted. Elaine has undergone a double mastectomy and despite being in the middle of her latest round of radiotherapy, nothing can dampen her praise for the care her boys have given. “They have eased many burdens and have made it much easier for myself and my husband. They keep my spirits up. They have totally shone,” she said.